Show off your love of zombies to all of your friends with these fantastic pieces of Zombie Drinkware here at Zombies Playground! 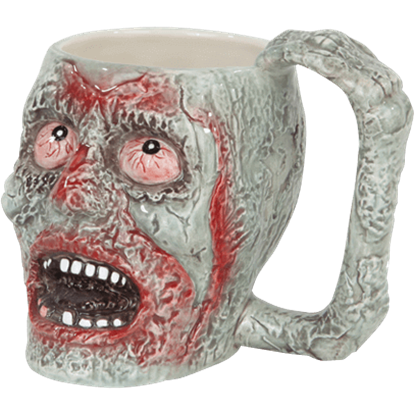 If you feel like a member of the undead before you get your coffee in the mornings, one of our zombie mugs makes the perfect choice. Alternately, you can enjoy your favorite Zombie cocktail with our zombie wine glasses and zombie goblets. Our zombie glass sets come in multiple fun designs for fans of the undead to enjoy. We carry a variety of zombie humor and sculpted zombie cups, some with stainless steel inserts to ensure that they can be used safely with consumables. Take a moment to browse our selection of zombie drinking glasses to find the perfect piece for your table setting! 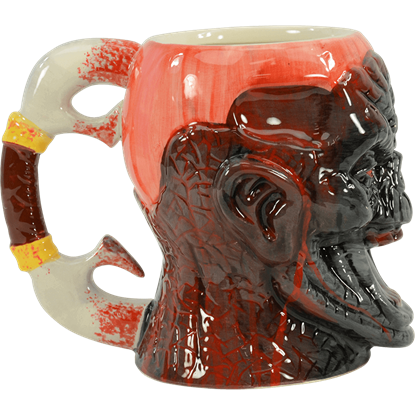 After waking up, you may feel like a member of the undead prior to having some caffeine, but this sculpted mug makes the perfect solution! Drink your favorite beverage from the Bloodshot Zombie Mug for a real jolt. Do you dare risk a drink from a zombie skull? You do? Perhaps we shall just have to make it more dangerous - why not enjoy your drinks from a bloody zombie head? Or, more realistically, from this Bloody Zombie Mug? For a slow morning, or one that came too soon, nothing quite chases away sleepiness like a lethal combination of coffee and zombies. 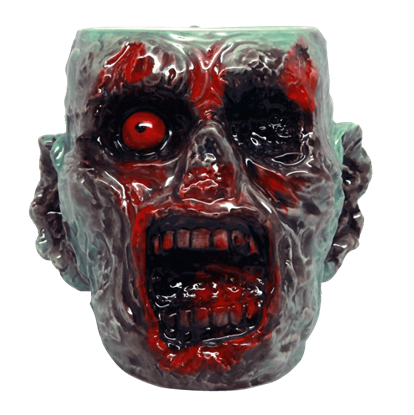 The Creepy Zombie Head Mug is an exciting start to the day for those intrigued by the undead. 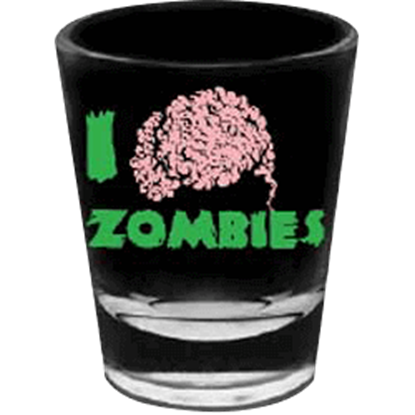 A superb collectible for anyone who loves all things zombies, from films to survival guides and everything in between, the I Love Zombies Shot Glass features a zombie themed design which is perfect for showing off this passion. Your dinner has never appeared as spooky as when the Mummified Zombie Goblet graces your table. 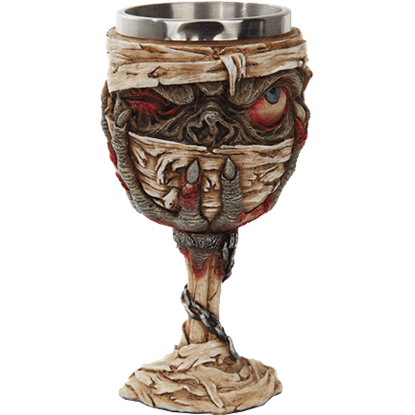 This gruesome goblet features the greenish face of a zombie peering out from wrapped bandages on its bowl. Do not allow yourself to be thirsty as you fend off hordes of zombies. 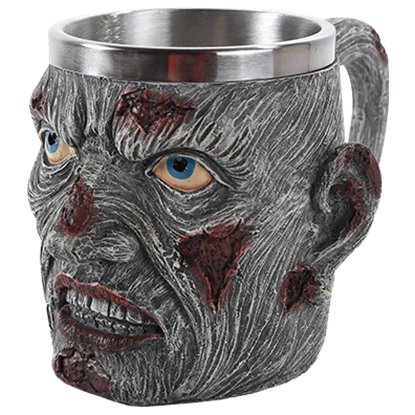 Be sure to grab the Zombie Sculpted Mug before the world ends and show those rotten zombies that you are not afraid to fight them. Sometimes, a bit of zombie humor is just the thing you need to brighten your day. 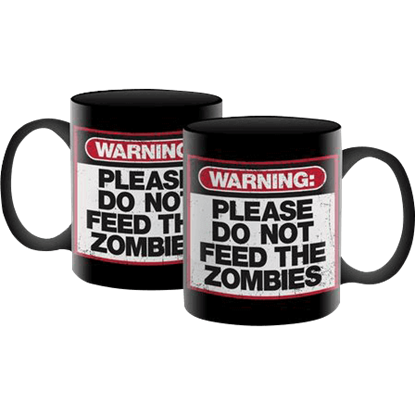 This Zombie Warning Mug brings a bit of zombie awareness to your morning routine, while delivering some good advice in classic warning sign fashion.